We provide the very best dog home boarding near you in the Taunton, Bridgwater and surrounding areas. Dogs deserve a holiday too! Welcome to Barking Mad dog holidays in Taunton, Bridgwater and surrounding areas. We are dedicated to providing the very best one to one home dog boarding service and can’t wait to meet you! We first met working at Ferne Animal Sanctuary in the late 1990’s and have been friends ever since. With our combined experience professionally and as dog owners we expertly match your dog to the perfect host. You can go away knowing that your dog will always enjoy his or her holiday as much as you are enjoying yours. 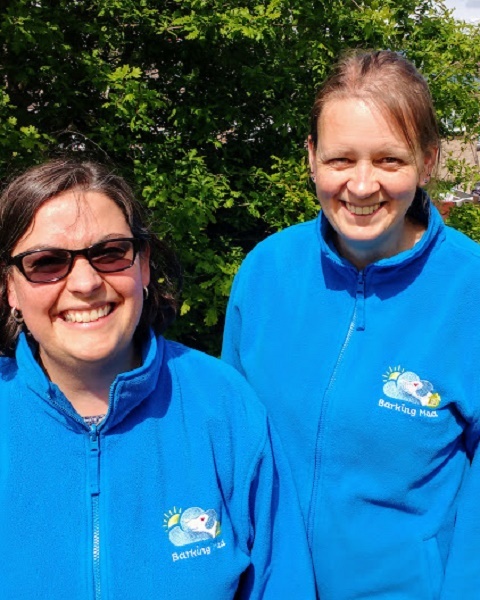 We are Naomi and Amy and have been running Barking Mad Taunton together since 2015. During 2017 and 2018 our business has grown and grown, but we still offer the same dedicated service to our customers that we always have. We first met working at Ferne Animal Sanctuary in the late 1990’s and have been friends ever since, Naomi now lives in Ilminster with her partner John and their three children and Amy lives in Greenham (Nr Crewkerne) with her husband Andy and their two children. With our combined experience professionally and as dog owners we expertly match your dog to the perfect host. You can go away knowing that your dog will always enjoy his or her holiday as much as you are enjoying yours. We have both always lived with dogs since a young age and wouldn’t be without out them. Naomi currently has Sprocket the Sprocker spaniel who is loving and loyal but also has a lot of baggage as he went through several homes that weren’t the right fit for him before he found Naomi and her family. Amy currently has Merry the Beagle who joined her family in autumn of 2017 and loves to keep Sprocket company during days in the office, she is also great friends with the family’s two cats, Marley and Poppy. Both of us have always owned rescue dogs and we understand that all dogs whether rescued or owned from a puppy have their individual requirements and quirks, some dogs needing a little extra TLC, especially when going on holiday for the first time. We know that each dog we meet has his or her own personality and needs to have care specifically tailored to their needs. This is why we take the time to match your dog to the most suitable host so everyone can enjoy their break. We have recently come to the conclusion that the business we own has grown so much in the time that we have had it that we need to sell a portion of it! We have decided to concentrate on the business that is closer to our own homes and therefore are going to sell the top half of our territory – North of Taunton up to Minehead and along to Burnham-on-Sea and including Bridgwater. If you would like more information about this, please contact us on the number/email below.